Phylogenetic relationships among the major subgroups of the salamander family Plethodontidae after Chippindale et al. (2004). Salamanders of the family Plethodontidae, commonly called "lungless salamanders," are widely distributed in eastern and western North America and Central America, with populations also in South America, southern Europe, Sardinia, and Korea. The family Plethodontidae is by far the largest salamander family with ~376 recognized species (see AmphibiaWeb's Amphibian Species Lists). These salamanders have figured prominently in experimental studies of the structuring of ecological communities (Hairston, 1987) and of the role of behavioral isolation in speciation (Arnold et al., 1993; Arnold et al., 1996; Houck ,1998; Houck et al., 1998; Houck and Verrell, 1993; Reagan, 1992; Verrell, 2000). The hypothesis that lunglessness in plethodontids evolved as a rheotropic adaptation for existence in cool, fast-flowing mountain streams has been invoked repeatedly (Wilder and Dunn, 1920; Dunn, 1926; Wake, 1966) but has recently been challenged more recently, generating much controversy (see Ruben and Boucot, 1989; Reagan and Verrell, 1991; Beachy and Bruce, 1992; Ruben et al., 1993; Mueller et al., 2004). Plethodontid salamanders occupy a great diversity of adaptive zones ranging from strictly aquatic ones to strictly terrestrial and even arboreal ones (Wake, 1966; Larson, 1984). The ancestral life history for plethodontids is believed to be a semiaquatic one, featuring gilled, aquatic larvae that inhabit streams and metamorphosed adults that show varying degrees of terrestriality (see Titus and Larson  for arguments relevant to this hypothesis). Morphological evolutionary patterns and their relationships to adaptive diversification of plethodontid salamanders are discussed by Wake and Larson (1987). The biphasic life history is observed for most members of the supergenus Desmognathus, (subfamily Plethodontinae) and the subfamilies Hemidactyliinae and Spelerpinae (taxonomy after Chippindale et al., 2004). Three species of the supergenus Desmognathus (Desmognathus aeneus, D. wrighti and Phaeognathus hubrichti) are strictly terrestrial, however, and have no aquatic larval stage. Many lineages of the subfamily Spelerpinae have experienced the opposite evolutionary change, eliminating the terrestrial adult phase and retaining the morphological and ecological characteristics of aquatic larvae throughout life (a condition termed "perennibranchiate"). Many perennibranchiate salamanders in this group are troglobitic and demonstrate the reduced pigmentation and vision characteristic of many cave-dwelling animals. Both the supergenus Desmognathus and subfamily Spelerpinae occur in eastern North America, with the latter group extending westward to the Edwards Plateau region of central Texas, where many troglobitic forms are found. The subfamilies Bolitoglossinae and members of the Plethodontinae (other than most Desmognathus) lack aquatic larvae and hatch as miniature adults from eggs laid on land or terrestrial vegetation. Members of the Plethodontinae include woodland salamanders of the genera Aneides and Plethodon, which occur both in eastern and western North America, the western North American genus Ensatina, and the genus Hydromantes of California (subgenus Hydromantes), southern Europe, and Sardinia (subgenera Atylodes and Speleomantes; Wake et al., 2005). Plethodon, Aneides, and Ensatina take refuge under logs and rocks on the forest floor during the day, becoming active on the surface at night when conditions are favorable. Members of the genus Aneides show varying degrees of climbing ability and associated arboreality (see Larson et al., 1981). Aneides aeneus and Plethodon petraeus (Wynn et al., 1988) demonstrate adaptations for climbing in rock crevices, as do members of the genus Hydromantes. Members of the subfamily Bolitoglossinae occur in western North America, Central America and South America. This group has undergone an extensive evolutionary radiation in the New World tropics, including highly arboreal and fossorial groups (Wake and Lynch, 1976). Convergent and parallel evolutionary origins of webbing of the feet are observed in the genus Bolitoglossa, associated with arboreality on moist tropical vegetation, and extensive foot-webbing occurs in other genera as well (Wake and Lynch, 1976; Alberch, 1981). Convergent and parallel evolutionary trends are observed also for elongate, fossorial forms among the tropical genera Lineatriton and Oedipina and the temperate genus Batrachoseps (Parra-Olea and Wake, 2001). The discovery of the first Asian plethodontid salamander in 2005 was a complete surprise. This fully terrestrial species is associated with rocks and rock crevices in wooded areas in the middle portion of the Korean Peninsula in South Korea. Min et al. (2005) placed this species in a new genus, Karsenia, in the subfamily Plethodontinae based on morphological and molecular data. The discovery of this taxon, together with the presence of Hydromantes in Europe, suggests that plethodontids formerly had a Holarctic distribution. In 1972, the Highlands Biological Station in Highlands North Carolina launched a series of conferences designed to stimulate the spread of current research on plethodontid salamanders. A selection of papers covering a wide range of topics in plethodontid biology were published in a formal volume derived from the fourth plethodontid conference (Bruce et al., eds., 2000). Skeletal structures of the feet of three species of Bolitoglossa (red = bone; blue = cartilage; photograph © Allan Larson). All plethodontid salamanders are lungless and breathe through moist skin. Plethodontids are unique among salamanders in having narrow grooves between each nostril and the upper lip. Males often have protuberances on the upper lip associated with the nasolabial grooves and a mental gland located beneath the mouth. Costal grooves are pronounced. Most plethodontids are completely terrestrial and lay eggs on land (subfamilies Bolitoglossinae and Plethdontinae and three species of the supergenus Desmognathus). Some have a biphasic life cycle with an aquatic larva and terrestrial adult (most members of the supergenus Desmognathus and subfamily Hemidactyliinae), and others are completely aquatic and permanently larval in form (some members of the subfamily Spelerpinae). Aquatic forms usually inhabit streams. The morphological characters given below are the ones standardly used to diagnose the salamander family Plethodontidae and to assess its phylogenetic relationships to other salamanders. The individual characteristics in most cases are shared with other salamanders and should not be interpreted as synapomorphies of the Plethodontidae. Absence of characteristics found in other salamanders is noted where it is important for distinguishing plethodontids from other salamanders and/or determining their relationships to other salamanders. These characteristics were assembled from a large number of original sources by Duellman and Trueb (1986), Larson (1991) and Larson and Dimmick (1993). Premaxillary bones may be paired or fused to form a single bone. Bilaterally paired nasal bones each ossify from a single, laterally positioned anlage; long posterior processes of the premaxillae extend between the paired nasal bones and completely separate them. Maxillary bones are present and well developed. Bilaterally paired septomaxillary bones are present. Lacrimal bone is absent. Quadratojugal bone is absent. Pterygoid bones are present in larvae but not in metamorphosed adults. Internal carotid foramina are absent from parasphenoid bones. The angular bone is fused to the mandible. Ear bones feature fusion of the operculum with the stylus of the columella in some species and absence of the stylus in others. Replacement of vomerine teeth proceeds laterally and from the posterior. Teeth have a distinct crown and pedicel. Origin of the levator mandibulae anterior superficialis muscle includes the exoccipital. Nasolabial grooves are a synapomorphy of plethodontid salamanders. Males of most genera have cirri on the upper lip associated with the nasolabial grooves, and also have mental glands. Basilaris complex is absent from the inner ear. Recessus amphibiorum is oriented vertically in the inner ear. The otic sac is bulbar and partially vascularized. Fibrous connective tissue is present around the amphibian periotic canal. The periotic cistern is small. The periotic cistern protrudes into the fenestra. The first hypobranchial and first ceratobranchial (alternatively homologized as the first ceratobranchial and first epibranchial, respectively) exist as separate structures. The second ceratobranchial (alternatively homologized as the second epibranchial) comprises a single element. Lungs and the ypsiloid cartilage are absent. Larvae, when present, have three (subfamily Plethodontinae) or four (supergenus Desmognathus) pairs of gill slits. The scapula and coracoid bones of the pectoral girdle are fused to form the scapulocoracoid. Vertebral centra are opisthocoelous. Ribs are bicapitate. Spinal-nerve foramina are present in neural arches of all vertebrae. The pubotibialis and puboischiotibialis exist as separate muscles. Anterior glomeruli of the kidney are reduced or absent. Fertilization is internal. Ciliated epithelium is absent in the cloacal tube and/or anterior cloacal chamber of females. Epidermal lining is present in the anterior cloacal chamber of females. Evaginations are absent from the dorsolateral walls of the male cloacal tube. Anterior ventral glands are absent from the cloacae of females. Spermathecae are present in the female cloacal chamber. Glands secreting into the dorsal walls of the female cloaca are absent. Anterior ventral glands are present in male cloacae. Posterior ventral glands are present in male cloacae. Kingsbury's glands are present in male cloacae. Dorsal pelvic glands are present in males. Lateral pelvic glands are present in males. Glands secreting into the male cloacal orifice are present. Parental care of eggs is usually by females and sometimes also by males. The diploid number of chromosomes is 26 or 28. The family Plethodontidae is classified in the caudate suborder Salamandroidea (Duellman and Trueb, 1986) which contains all of the internally fertilizing salamanders. Estes (1981) formerly recognized a separate suborder (Plethodontoidea) for the family Plethodontidae. Traditionally, Plethdontidae was subdivided into two subfamilies, Desmognathinae and Plethodontinae, the latter of which was further subdivided into the tribes Bolitoglossini, Hemidactyliini and Plethodontini (Wake, 1966; Lombard and Wake, 1986). However, more recent phylogenetic analyses using whole mitochondrial genomic DNA sequences (Macey, 2005; Mueller et al., 2004) and combined mitochondrial DNA, nuclear DNA and morphology (Chippindale et al., 2004) have called into question the monophyly of these groupings. Chippindale et al. (2004) recommended several taxonomic changes consistent with their phylogeny that required minimal changes to traditional taxonomic arrangements, including: 1) elevating the tribes Hemidactyliini and Bolitoglossini to the subfamilies Heimidactylinae and Bolitoglossinae; 2) making the subfamily Plethodontinae equivalent to the former tribe Plethodontini plus Desmognathus and Phaeognathus, with those genera forming the supergenus Desmognathus within Plethodontinae; 3) recognizing the subfamily Spelerpinae to represent remaining members of the Hemidactyliini, reserving the name Hemidactylinae for Hemidactylium. Similarly, Macey (2005) recommended: 1) discontinuing recognition of the subfamily Desmognathinae, instead including that group within Plethodontinae along with Hydromantes; 2) making the subfamily Plethodontinae equivalent to the former tribe Plethodontini; 3) elevating the tribe Bolitoglossini to subfamilial status; 4) placing Hemidactylium in its own subfamily (Hemidactylinae); and 5) recognizing remaining taxa previously assigned to Hemidactyliini in their own subfamily. Phylogenetic studies of Larson (1991) and Larson and Dimmick (1993) indicate that the Plethodontidae is a fairly distant relative of the other internally fertilizing salamanders and that this family has no close relatives among extant salamanders. These studies are based on phylogenetic analyses of ribosomal RNA sequences and diverse morphological characters. Lombard and Wake (1986) provided a hypothesis for higher-level plethodontid relationships based on 30 morphological characters, with particular attention to evolution of the tongue and related structures. A novel feature of their analysis was the decision to use their earlier integration of characters related to tongue morphology and function to use eight functional modes (Lombard and Wake, 1977) as terminal taxa. Each mode included one or more genera. Modes I (Desmognathus, Phaeognathus) and II (Plethodon, Aneides) included taxa with generalized morphology and were characterized functionally as having attached protusible tongues. Modes III (Ensatina), V (Hemidactylium), and VIII (Batrachoseps) have derived morphologies but retain an anterior muscular attachment of the tongue to the lower jaw and were characterized functionally as having attached projectile tongues. The remaining genera were grouped into modes IV (current spelerpines), VI (tropical plethodontids, supergenus Bolitoglossa), and VII (Hydromantes). Modes III – VIII were all considered to be independently derived from generalized ancestors, similar to modes I and II, and extensive homoplasy is required under any phylogenetic hypothesis. Parsimony analysis of their results indicate a basal split between Desmognathinae and Plethodontinae, and, within Plethodontinae, Bolitoglossini as sister to (Hemidactyliini + Plethodontini). However, this was only marginally more parsimonious than their preferred tree, which was a basal split between Desmognathinae and Plethodontinae, and, within Plethodontinae, Hemidactyliini as sister to (Bolitoglossini + Plethodontini). Mueller et al. (2004) analyzed complete mitochondrial genomic sequences from 22 plethodontids using partitioned and unpartitioned Bayesian, maximum likelihood, and maximum parsimony. They recovered congruent trees that contrasted strongly with traditional taxonomic groupings based on morphology, rejecting monophyly of three of the four major groups. Chippindale et al. (2004) investigated plethodontid relationships using separate and combined analyses of morphological and molecular data. Morphological data for osteological characters originally described by Wake (1966) were confirmed and coded from skeletal preparations and from the literature for vertebral (Edwards, 1976), auditory (Lombard, 1977), cloacal (Sever, 1991; 1994), and tongue morphology (Lombard, 1977; Lombard and Wake, 1986). Molecular data included portions of the mitochondrial cyt b and ND4 genes as well as the nuclear-encoded RAG-1 gene. Parsimony and Bayesian analyses of both separate and combined morphological and molecular data placed desmognathines nested within plethodontines. Macey's (2005) alternative analysis of the 27 whole mitochondrial genomic sequences from Mueller et al. (2004) using parsimony recovered topologies that differed significantly from the model-based analyses of Mueller et al. (2004) using the same data. Most significantly, Macey (2005) recovered Hemidactylium as the sister taxon to all other plethodontids, a result Mueller et al. (2004) also found when using maximum parsimony, but not maximum likelihood or Bayesian methods. Min et al. (2005) investigated the phylogenetic position of Karsenia using Bayesian phylogenetic analysis of the nuclear-encoded RAG-1 gene, placing Karsenia as the sister taxon to a clade comprising Aneides and members of the supergenus Desmognathus (sensu Chippindale et al., 2004). Alberch, P. 1981. Convergence and parallelism in foot evolution in the neotropical salamander genus Bolitoglossa, I. Function. Evolution 35:84-100. Arnold, S. J., N. L. Reagan, and P. A. Verrell. 1993. Reproductive isolation and speciation in plethodontid salamanders. Herpetologica 49:216-228. Arnold, S. J., P. A. Verrell, and S. G. Tilley. 1996. The evolution of asymmetry in sexual isolation: a model and a test case. Evolution 50:1024-1033. Beachy, C. K. and R. C. Bruce. 1992. Lunglessness in plethodontid salamanders is consistent with the hypothesis of a mountain stream origin: A response to Ruben and Boucot. American Naturalist 139: 839-847. Bruce, R. C., R. G. Jaeger, and L. D. Houck, eds. 2000. The Biology of Plethodontid Salamanders. Kluwer Academic/Plenum Publishers, New York. Dunn, E. R. 1926. The salamanders of the Family Plethodontidae. Smith College. Northampton, Massachusetts. Houck, L. D. 1998. Integrative studies of amphibians: from molecules to mating. American Zoologist 38:108-117. Houck, L. D., A. M. Bell, N. L. Reagan-Wallin, and R. C. Feldhoff. 1998. Effects of experimental delivery of male courtship pheromones on the timing of courtship in a terrestrial salamander, Plethodon jordani (Caudata : Plethodontidae). Copeia:214-219. Houck, L. D., and P. A. Verrell. 1993. Studies of courtship behavior in plethodontid salamanders - a review. Herpetologica 49:175-184. Larson, A., D. B. Wake, L. R. Maxson and R. Highton. 1981. A molecular phylogenetic perspective on the origins of morphological novelties in the salamanders of the tribe Plethodontini (Amphibia, Plethodontidae). Evolution 35:405-422. Macey, J. R. 2005. Plethodontid salamander mitochondrial genomics: A parsimony evaluation of character conflict and implications for historical biogeography. Cladistics 21:194-202. Min, M. S., S. Y. Yang, R. M. Bonett, D. R. Vieites, R. A. Brandon, and D. B. Wake. 2005. Discovery of the first Asian plethodontid salamander. Nature 435:87-90. Mueller, R. L., J. R. Macey, M. Jaekel, D. B. Wake, and J. L. Boore. 2004. Morphological homoplasy, life history evolution, and historical biogeography of plethodontid salamanders inferred from complete mitochondrial genomes. PNAS 101:13820-13825. Parra-Olea, G., and D. B. Wake. 2001. Extreme morphological and ecological homoplasy in tropical salamanders. PNAS 98:7888-7891. Reagan, N. L. 1992. Evolution of Sexual Isolation in Salamanders of the Genus Plethodon. Ph.D. dissertation. University of Chicago. Reagan, N. L. and P. A. Verrell. 1991. The evolution of plethodontid salamanders: Did terrestrial mating facilitate lunglessness? American Naturalist 138:1307-1313. Ruben, J. A. and A. J. Boucot. 1989. The origin of the lungless salamanders (Amphibia: Plethodontidae). American Naturalist 134:161-169. Ruben, J. A., N. L. Reagan, P. A. Verrell and A. J. Boucot. 1993. Plethodontid salamander origins: A response to Beachy and Bruce. American Naturalist 142:1038-1051. Sever, D. M. 1991. Comparative anatomy and phylogeny of the cloacae of salamanders (Amphibia: Caudata). I. Evolution at the family level. Herpetologica 47:165-193. Sever, D. M. 1994. Comparative anatomy and phylogeny of the cloacae of salamanders (Amphibia: Caudata). VII. Plethodontidae. Herpetological Monographs 207:283-301. Verrell, P. 2000. Crawling apart: Mating behavior and speciation ... in salamanders. Bioscience 50:844-845. Wake, D. B. and A. Larson. 1987. Multidimensional analysis of an evolving lineage. Science 238:42-48. Wake, D. B. and J. F. Lynch. 1976. The distribution, ecology and evolutionary history of plethodontid salamanders in tropical America. Natural History Museum of Los Angeles County Science Bulletin 25:1-65. Wilder, I. W. and E. R. Dunn. 1920. 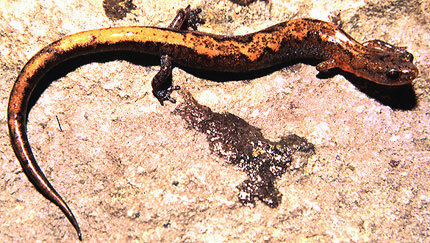 The correlation of lunglessness in salamanders with a mountain brook habitat. Copeia 1920:63-68. Wynn, A. H., R. Highton and J. F. Jacobs. 1988. A new species of rock-crevice dwelling Plethodon from Pigeon Mountain, Georgia. Herpetologica 44:135-143. David Heyse, Richard Highton and Todd Jackman contributed to the preparation of this Tree of Life page.